Delphi Core Component for ASIO and VST. This has to be installed first. All Components rely on this basic routines. 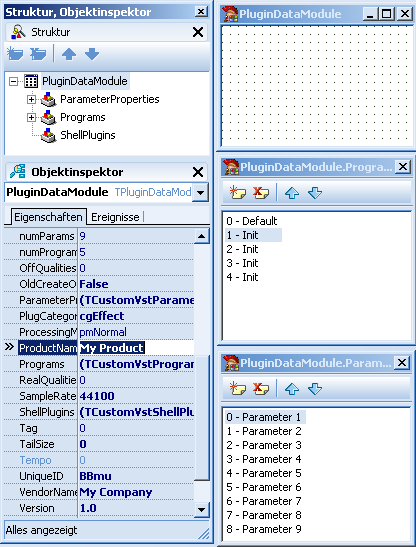 Within this package all necessary data types are defined. There are also several optimized math routines. Delphi Component for easy access to VST-Plugins. For example Tobybear’s MiniHost was built around this component. Also he has done a lot of development on this piece. So please visit his homepage. Delphi Component for easy access to ASIO-Soundcards. It is well tested over the years and thus works with any soundcard with ASIO drivers. Delphi Wizard for easiest development of VST Plugins. There are several demos included in the package ranging from filters over dynamics to synths and other utilities. The Electri-Q is probably one of the famous examples of what can be done with it. I have cowritten these components with Tobybear.